The Vikings and their boats are intrinsically linked. The sea worthy Viking people were famed travellers and traders, often sailing to foreign lands to barter and to find silver and other materials to bring back home. To do this boats were essential to the Norse people, to travel the distances they did mean’t they needed seaworthy vessels that were up to the job of vast ocean travel. Not only did the Vikings need boats that were capable of travelling vast distances and crossing wild ocean waters, they also liked to travel in style. The Vikings would bring their unique design of patterns and animals to their boats like they did to all their other craft work. Often ferocious animals like dragons would adorn the hulls or heads of the Viking boats, signalling to any land dwellers that the Vikings had arrived. When conjuring an image of a Viking boat, of course the first to come to mind is the iconic Viking longship. This style of boat is synonymous with the Vikings as the vessel they used to raid and plunder many a foreign land. These raids were the reason this is the boat that is attached with the Vikings, but there is much more to the range of boats the Vikings used in everyday life. The Vikings were farmers and traders also, merchants of the sea who transported their cargo across vast oceans. A simple longship was not suitable for this style of work so today we will break the myth and explain the diverse range of boat classes used by the ancient Norse. Many of the Viking boat types and classes were constructed and designed in a very similar fashion. Wood working tools would be used to craft the boats and also to carve intricate patterns and designs that litter many of the Viking boat hulls from history. A party of Vikings returning home on their boats. Viking boats were built using the materials that were available to the craftsmen of the time. This meant wood was the primary resource and building material but iron was used as well. The type of wood used would typically depend on the local trees available but there are many examples of oak and pine being used and these hard woods would typically weather well. Iron nails were used for some of the fixing as well as washers, but it was also common for wooden nails and pegs to be used. Sails would have been made from local fabrics available, and before going into the ocean, the boats would typically be sealed with a tar mixture on the hull to prevent the wood from soaking up to much water and proving it more seaworthy. The Vikings boat classes can be relatively easily divided into smaller classes, which in some case have their own subclasses as well. All of these uses and styles of boats had their own name in old Norse, making it simple for us to break them down. The knarr ship was designed for long voyages across the ocean to deliver and bring back cargo and goods from far flung lands all over Europe. 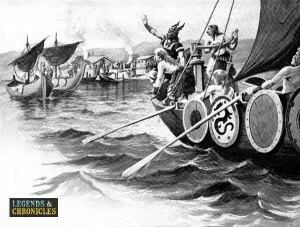 The knarrs were capable of sailing in rough ocean seas, with a rounder hull the knarr was capable of surviving larger waves and more dangerous swells. In the middle of the hull was a deep cargo hold that would typically be open, and at the port and stern, the deck would have further space underneath it for stashing even more cargo. The knarr would have a large mast and this would be its primary method of propulsion, with a knarr having much fewer oars than a Viking longship. In addition the crew of a knarr was quite small at up to 30 Vikings, the emphasis here was on cargo over passengers and crew. To get an idea of the potential size of the knarr ships, we believe they would be up to 60ft long, around 18 metres, and up to 16ft wide, around 5 metres. A knarr hull was actually found in Denmark giving us a good idea of what a real knarr would have looked like. The Byrding ship was designed for inland transport mostly, to move and transport goods and cargo around the local islands or nearby settlements by coastal routes or even from Scandinavian island to island if required. The Byrding had a large sail and oars, with a smaller crew than the larger knarr class ship. It’s thought the crew size of the Byrding would be up to 15 Vikings with plenty of the ships room given to storage of cargo. Fast and seaworthy, the Byrding was for all intents and purposes a smaller, and faster version of the Knarr. The skute ship was the smaller class of Viking ship, used for passenger transport, small journeys and general travelling where a larger ship did not make sense. Its thought the term ‘skute’ referred to a wide selection of smaller vessels all possibly with their own uses, but all being of small stature. The legendary longship was also a class of its own, having a variety of sub classes with subtle size and shape differences. The goal of the Longship was the same whatever class though, to effectively transport the Vikings across the ocean. 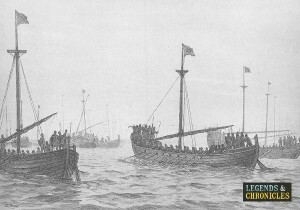 The ratio of passenger to cargo was highly weighed in the favour of the passenger, with the goal to get as many Viking across the ocean as possible. The longship was then actually subdivided into smaller classes further, each differing in size and stature. The main classes of the Viking longship were the smallest from the Karv, to the slightly larger Snekkja, moving up to the Skeid and finally up to the warship like Busse. An essential tool in many Vikings lives, the boats were the tools the Vikings used to keep their trade routes open. the notorious travellers shipped cargo all over Europe and even further afield into Asia. For each task the Vikings had a boat for the job, and these boats have been found and documented all along the coastlines of Scandinavia.